Members of the Trinidad and Tobago men's hockey team with their silverware after clinching the 2017 Indoor Pan Am Hockey Cup on Saturday. PHOTO COURTESY GUYANA CHRONICLE. President of the Trinidad and Tobago Hockey Board (TTHB) Douglas Camacho praised the national men’s hockey team after they qualified for the 2018 Indoor Hockey World Cup, saying the team was patient and stuck to their game plan. 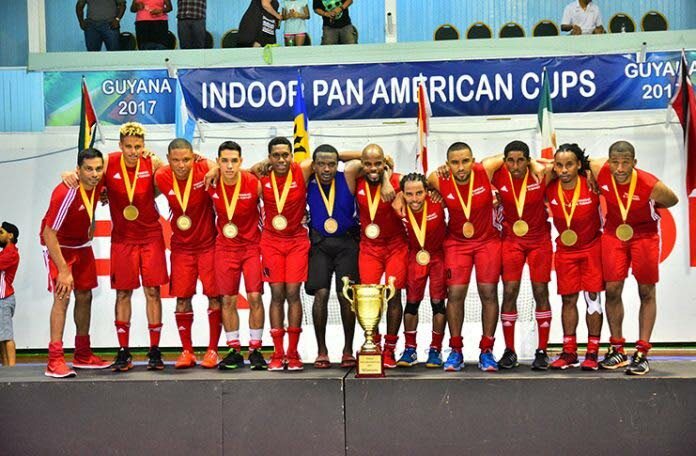 TT booked a place in the 2018 World Cup in Berlin, Germany after defeating Argentina 7-0 in the final of the 2017 Indoor Pan American Hockey Cup in Guyana, on Saturday. It is the second time the TT men’s team qualified for the World Cup following the team’s 2007 debut. Only the top team from the Pan Am tournament qualified for the World Cup. TT pulled off a remarkable comeback against Canada in the last preliminary round match, which sealed a spot for TT in the final. Camacho said the comeback by TT demonstrated the team can play from behind. Camacho said they would depend on assistance from the Sport Company of TT, corporate TT and fund-raising activities to fund the trip to the Indoor Hockey World Cup. Winston’s son Raphael was the TT hockey coach in Guyana and had to leave his team before the Pan Am tournament concluded. Raphael’s son Jordan played a major role on the team and won the Young Player of the Tournament. Reply to "Camacho hails national men’s team"